Over the past year, I’ve met many people experiencing rough sleeping and homelessness across the country and here in my home city of Oxford, where I’m an Oxford City Councillor and a campaigner working with women experiencing rough sleeping and homelessness. On the pavements of London, I’ve met people as young as eighteen sleeping rough on the streets for the first time. Also in London, I’ve met the less visible: women of colour and refugee women, struggling to stay alive. In Manchester, I met older people in their seventies experiencing the brutal reality of not having a home of her own. In Oxford, I’ve met trans women and gay women facing increased threats of violence because of their sexual identities and because they’re homeless. Last week in my home city, on a busy street corner, a woman removed her coat and jumper in the bitterly cold weather to show me her bruised upper arm and neck. She sobbed as she described being beaten by her abusive partner. She was also sleeping rough. 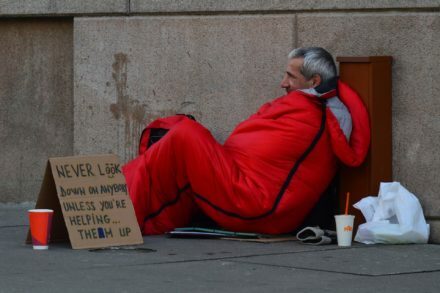 More than 320,000 people are experiencing homelessness in Britain today. The number of people sleeping rough has increased by 169% since 2010 when the Tories entered office. This is a crisis, and it is killing people. At least 449 people died on the streets in the last year, and the real total could be far higher. Behind these statistics lie thousands of lives, interrupted, thousands of human stories, tragic stories, warm, incredible and average stories, and thousands of kind-hearted, talented, people denied the opportunity to be seen as human and feel human, to feel the safety and security that having a home brings, in the sixth richest country in the world. Solving a crisis like this requires integrity and action, not just words. While this Tory government is distracted by its own internal squabbles over Brexit, through its ideologically bankrupt austerity programme, it has fuelled the humanitarian crisis that is homelessness. There are ordinary, everyday people up and down the country doing the work, campaigning, organising and volunteering in solidarity with those experiencing homelessness. I’m lucky enough to know many of these people. From all classes and backgrounds, they are running community projects, and creating safe spaces for the most vulnerable to enjoy a hot home cooked meal, where they won’t be judged. They run soup kitchens, bake cakes; they are barbers, hair dressers and beauticians, giving people sleeping on the streets some of their dignity back. These citizens are volunteers, who collect and distribute sleeping bags and make sure the people who are being dehumanised by the political system are seen, heard and valued. Fundamentally, charity on its own won’t solve the problem. The ideological project of austerity has cut services and benefits for those who need it most, and left many with no alternative but to exist on the streets. The homelessness crisis arose as a result of political choices, and ending it will require a political solution. That’s why I’ve been working with campaigners and volunteers from around the country to organise a national Labour Homelessness Campaign. From contacting campaigners across the country one thing has stood out: we’re all engaged in the same struggles, and our campaigns often mirror each other without realising it. The same issues are cropping up again and again. Too often those forced out onto the streets are being treated like criminals. The 1824 Vagrancy Act is still in effect and in use, and rough sleepers have told us of being moved on, stigmatised, turned away from shelters, their belongings taken, and their voices ignored. As a campaign, we’ll be encouraging Labour members to volunteer and campaign in solidarity with people experiencing homelessness. We’ll be fighting to make sure those with lived experiences have their voices heard. The Labour Party has grown in recent years to well over half a million members, many attracted by its commitment to reverse austerity. We can be a force to be reckoned with across the country. What’s more, Labour is in power in many of the urban areas with the highest concentration of homelessness. We’ll be working with Labour-run local authorities to ensure we’re taking advantage of the opportunity that creates, to stand unequivocally behind the homeless residents of our communities, to back their struggles and to do everything in our power to save lives. Homelessness is complex – it occurs for complex reasons and requires comprehensive strategies to overcome. But Labour can help. So join our Labour Homelessness Campaign, and join the Labour members and homelessness campaigners across the country committed to taking a stand, in solidarity with people experiencing homelessness. Shaista Aziz is a journalist, co-vice chair of the Fabian Women’s Network and co-founder of the Labour Homelessness Campaign.